6sqft’s series “My sqft” checks out the homes of New Yorkers across all the boroughs. 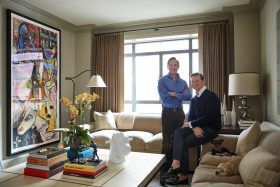 Our latest interior adventure brings us to the Upper West Side apartment of Canine Styles owners Mark Drendel and Chad Conway. Want to see your home featured here? Get in touch! When Mark Drendel and Chad Conway met on Fire Island 21 years ago, they didn’t know that they’d one day claim ownership of “the world’s only Dog Lifestyle brand.” Despite the wild success of Canine Styles, also the oldest dog emporium in New York City, this couple remains down-to-earth and grounded in their family, which includes their high school-aged son, 13-year-old border terrier Katie, and year-old miniature schnauzer Izzy. But of course, their home, located in the Art Deco Central Park West building The Century, is just as fashionable as their business. They describe Canine Styles as having “a flair for traditional, classic but up-to-date design,” which holds true for their recently renovated apartment, too. Mark and Chad’s basic design concept was wanting guests to not be completely sure what city or era they’re in. By mixing the space’s Art Deco bones with their modern art collection, contemporary furnishings, and antiques spanning from the 18th century to the 1960s, they’ve created a uniquely stylish space. 6sqft recently took a tour and chatted with this lovely couple about the history and future of Canine Styles, what a normal day at home looks like, and their thoughts on raising a family (human or four-legged!) in NYC.